"What an amazing Potala Palace!" exclaimed Andrzej Brozek from Poland in an interview in Lhasa on June 10. Tibet is one of the tourist destinations for the group Adrzej Brozek was in while traveling in China. They have visited Tibet for 4 days such as the Potala Palace, Jokhang Temple and Barkhor Street. "The next station is Norbulingka. Hence, we'll leave Lhasa for Yamdrok Lake." She introduced their group as composed of two parts: one is 13 people and the other is 16. They all have a keen interest in China. "It is easy to get a visa and it only cost us 4 days." In the afternoon of the same day, Italian John Peatlo is taking pictures in front of Jokhang Temple. He said, "I just arrived here 2 hours ago and I went directly to Jokhang Temple." John and his four friends spent seven days to get the visa and hired a local tour guide to introduce them to the holy city. Just beside John and his friends, Japanese tourists are also taking pictures for memories. A tour guide with family name of Yang from Shengjie Touri Guide Company introduced that she is in charge of serving Japanese tourists. This group has 19 members and will stay in Tibet for 4 days. "After we’re done with this group, I will go to serve the next group. Tibet tourism is on the boom. We are very busy now." The worldwide tourists are the major custom source of the stores and shops in the Barkhor Street. The shopkeeper of a Tibetan ornaments shop named "Xiao Er De Dian" said that recently, the foreign tourists increase gradually in the Barkhor Street. The guests in his shop are in an endless stream. "I have done business with several foreign tourists who are keen interested in small Tibetan religious objects. As they have no RMB, they even give me US dollars." The statistics of Tourist Administration of Tibe Autonomous Region shows that recently, more than 1,000 outbound tourists come to trave in Tibet every day. 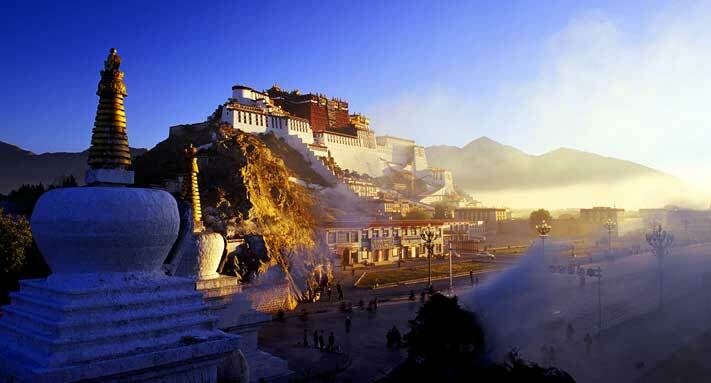 Just on June 10, there were 1,588 foreign tourists traveling in Tibet as part of 217 tourist groups. They are mainly from 40 countries such as U.S.A., Germany, Malaysia, Singapore, Australia, France, British, Japan, Netherlands and Nepal. The American tourists are the most, reaching 330, followed by 186 German tourists, 165 Malaysian tourists and 101 Singapore tourists.